No other coach was the last time a similar topic of intense debate as the Dutchman Louis van Gaal. As in other countries, his stay in Germany was a small spectacle and even for Bayern ratios the term of office of the Dutchman turbulent. In the fast-booting out in autumn 2009 followed dream football and almost triple and a chaotic episode season. Regardless of where one stands to Louis van Gaal: It is a special and polarizing coach. However, as was van Gaal to what it is today? And how is he anyway? Or: Who is he anyway? The way to the coach started for van Gaal, who was born on 8 August 1951 in Amsterdam, in childhood, when he did not go to autograph hunting, but rather pay attention to the work of the coach. 1971 van Gaal moved to the second team of Ajax Amsterdam, where he however not brought to the bench as the A-Team, which was at that time outstanding Johan Cruyff. This is exactly what is so special about van Gaal. Even if he can not produce a professional background, his career is not that of a typical trainer. He is not the one who deserved to be Active laurels, not the industry stranger who comes from a different sport, not the long-time assistant coach, who eventually emancipated, but also not the one who rose continuously after either in the youth field or had begun in the lower classes. Van Gaal's way is a mixture of all these facets. While his other professional positions at Royal Antwerp, Telstar, Sparta Rotterdam and AZ Alkmaar van Gaal had a side job. He worked as a sports teacher at the Don Bosco Vocational School as a part-time employee, where he was dealing with children from different layers. Here he gained experience for his coaching career - and here is probably also the reason why van Gaal wanted to work later in the favorite with young players and could. But already the player van Gaal thought like a coach. After smashing first engagements as an assistant coach, he heard the call of his first professional club, Ajax, where he was coach of the youth and the second team. Only now - when he received a full employment - he resigned from his job at the Don Bosco School in eleven years. In the following years, from 1988 to 1991, he was appointed Assistant Spitz Kohn, with whom he "fantastic" worked his own words, paused one year for the attainment of the coach ticket and was then assistant coach from the new Ajax coach Leo Beenhakker. But in the meantime he had higher goals: a post as head coach. He applied to other clubs, but was convinced by the Ajax board to wait for the heritage Beenhakker. In the following season - 1991/92 - then changed this after a few weeks to Real Madrid - and the way for van Gaal was free. He worked on all fronts of the association in organizational and structural matters, initiated changes in the lineup and tactics and also tinkering with the squad compilation. This is probably the most important peculiarity of Louis van Gaal: control. And so also had the majority of his conflicts to do with board members. This desire for absolute control can be seen as a strength and weakness. From boards of directors, but also of media, it is often described as ignorance, stubbornness, arrogance or - "advice resistance" interpreted - as it was called Uli Hoeness. This van Gaal is still with his trainer and supervisor-staff in close communication, calls his own words even advice. Communication he referred further as the central component of both the football game itself as well as its (Trainer) philosophy. However, communicating only refers to his staff and the players, by the Board, it can be most reluctant to talk purely in his work. However, he rarely examined in this context generally the conversation - certainly another weak point van Gaal. Although he often communicates with the players, but the players tend to seek the conversation with the coach rare. Whether this is due to the setting and the role of understanding on the part of the players or van Gaal remains to be seen. It shows, however, that van Gaal works almost exclusively with his squad, on his terms, under his great control and he "recognized" players. Then it works but really good. In his first season at Ajax - 91/92 - van Gaal won with the team the Supercup. Gradually, the team was always more his handwriting and it successes in. In six years at Ajax they also took three times the championship, once the trophy three times the Dutch Supercup, the UEFA Supercup again. The coronation learned the great Ajax team of the 90s, when you could get the 1995 Champions League and the Intercontinental Cup. It was the rebirth of the Ajax myth of the 70 with a football as he was rarely played nice and a tactic that completely dominated Europe. To play "Dominant means to create more scoring chances than the opponents. (...) I associate the term 'dominant' with offensive football and Pressing in the middle of the enemy. " This dominance fulfilled van Gaal's young stars perfect in their prime. They played a flexible 3-3-1-3 system. But not only the system was impressive, but also the manner in which it was played. In a casual one dominance and possession game with fixed positions reshuffles and player shifts were woven, it was swarming with short-pass relay races, double passports, "Kaatsers" (clapping dropped balls) and game relocations. Essential for this were the flexible midfielder. These included Frank Rijkaard - a hybrid of central defender and six, impeller, play-making Libero front of the defense and vacuum cleaner in one, in the Libero-style came in the offensive game to the front and was often responsible for the final pass there. Also very polyvalent was the big scorer - the vertical very moving shadow tip Jari Litmanen, who was as strong as the defensive central midfielder Davids and Seedorf. Your ball distribution and the initiation of the ball circulation and runs from the depths to the interfaces of the opponent's defense made them the key players of the game with the most most tasks. Another cornerstone of the success of the extremely young team (only 2 players from the starting 11 of the CL-final were older than 25 years) was the special relationship with van Gaal. There were shaped by him players who unconditionally followed him, were willing to learn and individually acted at the top level. During this period, many examples can be found that van Gaal not only the footballer looks, but also the whole person and his personality, so he knows, for example, your birthday for the players' wives. In the Netherlands, he is still regarded as one of the proponents of the "principle of holistic human or footballer". Thus supported van Gaal - had forged the also the death of his first wife Fernanda closely with the team - Patrick Kluivert, who had caused a car accident resulting in death, by visiting him regularly and clung to him. Likewise, he managed it at Finidi George, after his brother had been killed in Nigeria. And because of his style of play as a goalkeeper Edwin van der Sar - represented today by modern anticipation as keeper Manuel Neuer or Victor Valdes - was ridiculed by the media, van Gaal strengthened him publicly back and countered the criticism. The following three years after Ajax, which spent van Gaal at FC Barcelona, ​​were not necessarily the most successful, although the championship, once won the Cup and the UEFA Super Cup twice. His game realizing this was implemented by the eight-year tenure of Johan Cruyff already to a large extent in the club, but van Gaal came with his directness not cope with the Spanish way of life. Consequently van Gaal not found the right access to his team. Critics van Gaal sometimes loses the entire team from the eyes, because he too was dealing with the individual players. In fact, van Gaal takes care of an individual approach to each, leaves of experts create player profiles, works on a human image schema by Leo van der Burg and leads with potential recruits conversations in their familiar surroundings. Herein lies the danger that the equality of the player suffers. Some players feel neglected then in elevated proportions. His confidence in young players showed in Barcelona when he built from the youth today's top players like Xavi, Iniesta, Victor Valdes and Puyol in the team. However, after the end of his tenure was followed for the club as for van Gaal worse times. Both in the Dutch national team as well as his second term in Catalonia, as well as his work as a technical director at Ajax ran much wrong and the success was complete. For this he was at the KNVB move some when he said "the systematic, integrated work of all ages in Dutch football" introduced with the master plan, which was to give all children a basic aid and in a second step, a training professional. AZ: "The Totaalvoetbal transferred to the Modern Age"
After a year's hiatus, sat in van Gaal then the upward one, when he returned to AZ Alkmaar. Building on the groundwork of Co Adriaanse, managed van Gaal also to lead a group assumed to convince of his ideas and to impress with his work. Even today, says both the Dutchman of his former troops, the openness and the festivals and club nights that we spent together, as well as its players with his method, his human warmth and the exact statements that he and regarding preparation, installation, training methods perspectives were. After they had each just missed the championship title and in the first two years in the second year the Cup, got the third season to absolute disappointment. Guide players were injured, not recorded the team. For this purpose, the unprofessional behavior of some players as well as bad luck and failure came at the Pits. It slipped to eleventh place - and van Gaal resigned because he believed his team not being able to reach. Only thanks to a revolt on the part of the players he let himself be swayed - that was the turning point for his team. 2007/2008 was too late to save, but in the following season, van Gaal and his team climbed to the summit - a historical and yet highly-sovereign championship title for AZ. Nominally it was in the master year a 4-4-1-1 system, which mainly but lived by its flexibility. 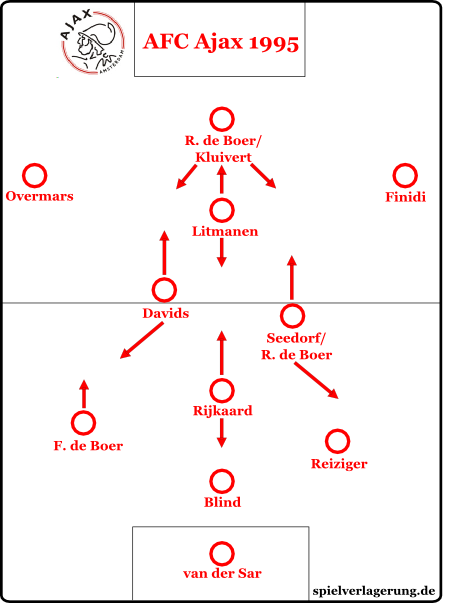 They took when the opposition possession a wide 4-4 2-diamond formation a, which was designed to deflect the opponent diagonally on the outside, yet the system was in offensive play much more fluid and extremely difficult to summarize in a combination of numbers: It was between a 4-4-1-1, a 4-3-3, a 4-3-3 and a 4-3-1-2 crooked. The game lived flexibility and was difficult to grasp, especially on the offensive in a combination of numbers. Although the possession style of van Gaal was still clearly visible, but also more value it has now been placed on switching actions at winning the ball. 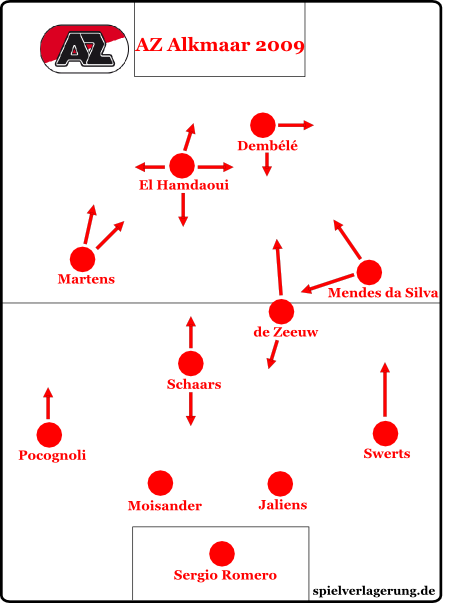 The central body of the game was also at AZ midfield to the more related hedging and uplifting captain Schaars, the vertically gambling playmaker de Zeeuw, who with the pulling inward David Mendes da Silva and the operating in a very free role as a hanging lace El Hamdaoui combined and exchanged positions, and the intelligent and polyvalent Martens. Because so much movement and flow was in the game, cheered the Guardian, van Gaal had transferred the Totaalvoetbal to modernity. With so much praise, we went on to a top club - FC Bayern. Already the press conference on the occasion of the first day was legendary: "Mia san mia, we are we - and I am me." "I am I" or the enormously important " The mind is stronger than the body " as guiding principles of his philosophy. We Also his self-characterization: ". Confident, arrogant, dominant, honest, hard-working, innovative, but also warm and friendly" The Innovative presented van Gaal at once to the test. He sat on a computer guru, cameras and digital measurements on the practice courts with analysis tools (such as the assisting during physical training LPM) system, a psychologist and the regular completion of questionnaires by the players. This he was able to impress by its systematic training work. In addition to (continuous) fits the repertoire of his training practices mainly contains always slightly varying exercises according to the pattern "Piggy in the Middle" and scrimmages with provocative rules. Thus, the objectives are woven into the exercises that can be performed with ball then all of them. In this second round the team played exciting football and could still celebrate the championship thanks to successful comeback. 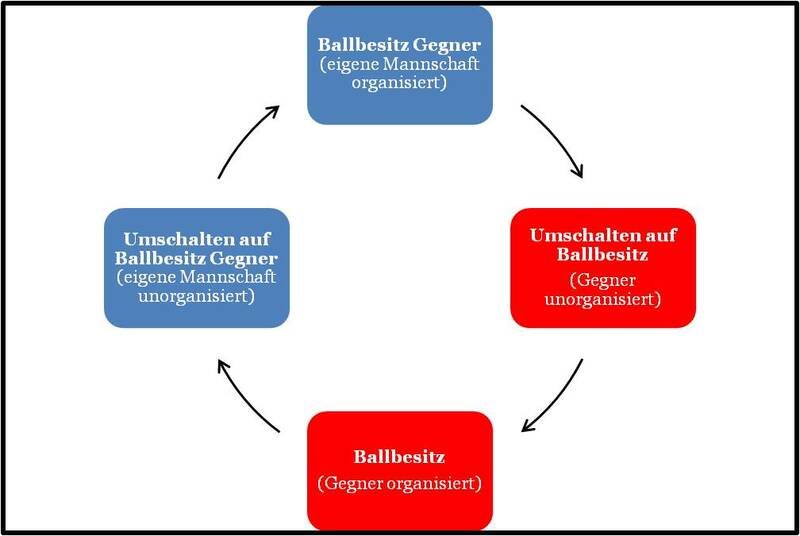 The ball possession-oriented, liquid, but precisely to the player coordinated and systematic style proved for the Bundesliga than good. In the Champions League they were for the first time in years successfully. With a little luck and some strong games, the final was reached, but due to the defeat missed the historic triple. A "celebration Beast" was born by the success, and with him a legendary speech at the Munich Town Hall balcony. The success made from van Gaal a media darling and from his Bayern a topic of conversation and even a popular figure. But the success of blinding - big changes were not for the new season. It came as it had come. A poor preparation and form of crises through the World Cup, a huge injury crisis, a poor start to the season and extreme psychological pressure were ultimately the grounds for an ultimately disappointing season. Then there were the constant quarrels between van Gaal and president Hoeness. This culminated in van Gaal's ultimately dismissal. Even during those weak second season, especially the lack of flexibility van Gaal has been criticized as too firmly attach to possession and let play ausrechenbar. However, this possession is the FC Bayern often forced, as most opponents - especially in the Allianz Arena - focus on defending and play for a draw. Furthermore, van Gaal took very well some changes - always small, but still important. "In the game it is important that we ensure, through our position game to build from the back, to bridge the midfield and draw us many high profile scoring chances. (...). It is (...) essential that the rooms are used optimally and that the passports and assumptions are executed technically clean "
Thus, positional play indicates the optimum use of the space by the constant occupation of the positions - which is only important that the position is occupied, but not who they occupied - from which combine the player to a defensive formed crack can. But van Gaal divides the court into 18 rectangles, in which the players operate. The position of the vertical pass game should normally only be done if there is a high success rate, otherwise the ball is played horizontally. It then attempts to continually move up. To achieve this goal, to push the enemy back and to relocate own gravity forward, the full-backs have an important role. Their importance in van Gaal has changed with the changes in modern football over the years from a purely defensive "killer" for offensive valuable key players at the most radical. With a change of passport they can be unlocked in order to then come forward, bringing the game focus is automatically pushed forward. Then we moved on until open gaps or spaces into which the risky pass can be played. Either individual players tear these gaps (hold play wide, pull the opponent up, opponent move) or by the rapid ball circulation of the ball comes to a place where the enemies have a lower number and thus no presence. Mental and physical this game is pretty powerful and gentle, while the opponent who has to move against the circulation time and again, tired in both areas. So he can not hold more than 90 minutes, which leads after some time to a higher success rate of displacements his game. This patient Zermürbungsspiel means for van Gaal to play "broken" the enemy. "Change of position are not the solution to play out a compact defense. (...) I find that a player must operate from a certain position. This position is not tied to specific lines. In this position, it is about a space that a player must play on and can . (...) He has to create from this position space for the other players, but at the right moment the room and shut again. " It is important to check the space on the field and to rule over it, to create it, to fill, to close, to steer and move, run out whereupon the coordinated movements and processes within the team is. The whole system is highly complex, sophisticated, but also sensitive and therefore susceptible to interference. Nevertheless, it is effective, but just needs a good preparation and understanding and Fitness - especially spiritually. It's always about the player and creates space. He may leave his position in order to create a surplus to open your own space or deduct opponents. However, these are players shifts that also belong to the role and function of the players as to the overall tactical strategy. Real change in position are then more effective if space can be created, but first what the defense has to be broken by the position of the game to give the position changes the desired effectiveness. For a disordered enemy, this is much more effective than against a compact opponents. But the failure was not the only reason for van Gaal's failure in Munich: Louis van Gaal, the weaknesses were calculated at FCB, to which he and his philosophy otherwise fit well, especially uncovered. A trainer who strives most control who speaks little with his superiors, who wants to work on his own terms and has a certain originality with specific rules, norms and values, it will have a hard Sabener road. 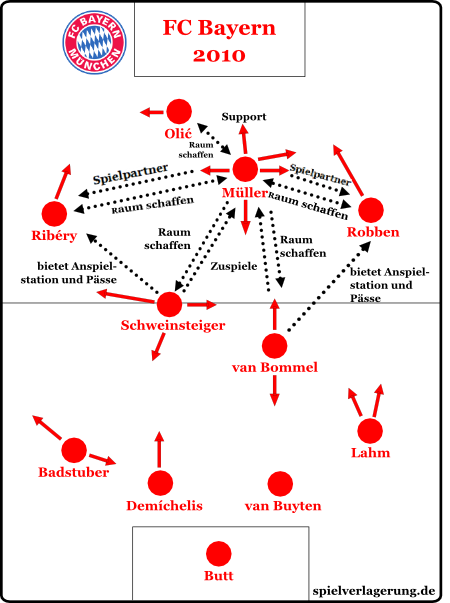 On 10 April 2011, the Chapter Louis van Gaal at Bayern was final story - less than a year earlier, he had still been the savior and king of Bavaria, and thus a comparison urges particular attention to - with King Ludwig II of Bavaria . That fairy king, monarch from 1864 to 1886, was like van Gaal a headstrong character with very special (value) ideas and some debatable decisions, which also communicated little with his immediate superior. They both wanted to be infallible, but both were not, both targeted at the most control for what they ultimately proved fatal, both had previously been transfigured into saviors. This transfiguration is observed today with regard to Ludwig II again, which is celebrated as a fairy tale king. In fact possess his visionary construction projects in many ways an extreme value. As Ludwig had built impressive castles that were never fully completed, van Gaal wanted to build a team in the spirit of total soccer ball with FC Bayern. As Ludwig wanted to transfer the idea of ​​the Middle Ages using the latest technology in the 19th century, van Gaal tried to adapt by similar means, the spirit that coined the Ajax teams of the 70s and 90s to the modern football. Louis II and Louis van Gaal had a political or a sporty concept, a very good concept, but many - especially the end of their term of office - not so affected. But for the situation and the circumstances (tense and tricky political situation and influenced by many complicated confounders season 2010/11) were able to bring out a lot both still. Thus, the concept of the Bavarian monarchs until years later achieved its full effect - the retired as sustainably out alternate end buildings Louis the daily business of that reality before, during van Gaal was apparently more basic research and long-term success is interested as to short-term - and so probably everyone hopes Bayern fan, that the work of van Gaal will show in the near future nor his lasting impact. Certainly there are differences between Louis II and Louis van Gaal, but the similarities are amazing. They were both Bavarian king a long time, short time period, van Gaal joins practically in a number one: King Louis IV of Bavaria - a misunderstood, but not infallible genius. Two more articles on van Gaal's tactics/philosophy. Likes his wingers cutting in. Robben and Ribery for example. Valencia may leave or be used at RB? 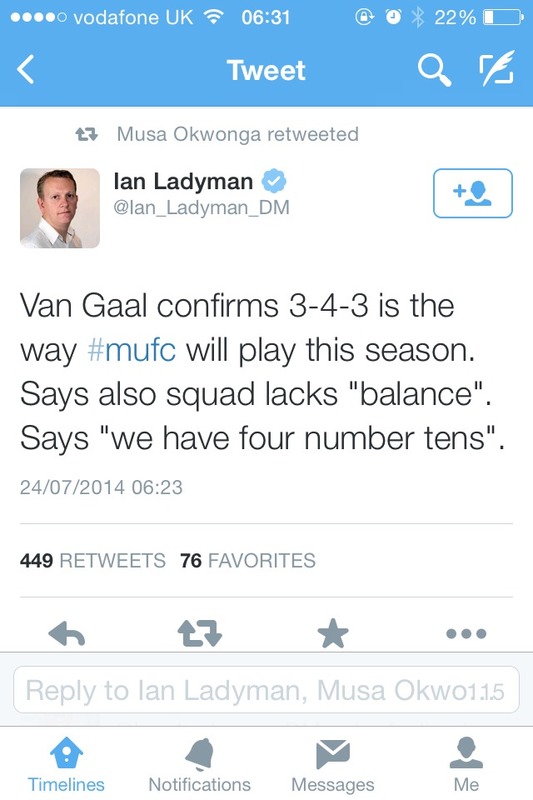 I doubt van Gaal will use 5 at the back with us. He's said the only reason he's switched to it with Dutch is Strootman's injury. If he does do it with us, wouldn't be surprised to see Carrick back there, likes ball playing CB's. We have the players to use the system, perhaps in bigger games. Expect 4 at the back on regular basis. What it tells me is he will look at his players and use them to their strengths good signs. I don't think Rooney could do what Robben did last night, he'd be probably be better where Sneijder played and Nani as the pacey one further forward. Indeed. He'll pick the system that best suits the players he has and has capacity to change the system depending on opposition or situation. He used a 4-4-2 at times when he was at AZ Alkmaar i've read. He generally favours 4-3-3 though. Intrigued to see how we shape up under van Gaal. It'll be nice to have a bit of tactical flexibility. Despite that article, expect us to play 4-3-3 most of the time but he'll have other formations in mind for certain opposition. He keeps the opposition guessing. Since Netherlands beat Spain, before every game people have questioned whether he'd stick with 3-5-2 or switch back to 4-3-3. I think the last game against Mexico, the press were told before the game that Kuyt was going to play in the middle with Blind at LB, which as we saw wasn't true. He can change his formation during the game too as we've seen depending on the situation and it's worked. He's not afraid of replacing his stars if they're struggling or if the team needs something different. Certainly will be an interesting season, hopefully more successful too. I was quite surprised by it despite reports that it would be used. A more positive approach though than his Dutch side. So if we have four number 10's who's days are numbered.? Kagawa and Fellaini. Kagawa just isn't working, even when he plays in there, he doesn't impose himself on the game like Mata, Rooney or even Januzaj. 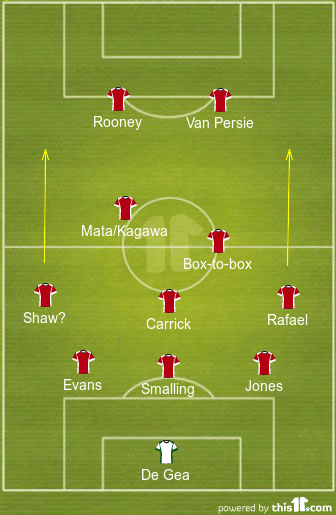 5-3-2/3-5-2 is ideal to accommodate Mata, Rooney and van Persie. The squad has good players, but it is imbalanced, it's top heavy. Apparently we've been playing 4-4-2 (or some variation) since 1975 when Tommy Docherty introduced it at the end of the 74/75 season. It's a nice change in my opinion. It's an exciting time if you're interested by tactics. Title suggest otherwise but a bit of everything in here. May have missed something van Gaal has said or misunderstood but it doesn't seem like it's certain we will play 3 at the back when the season starts. I've seen van Gaal say he'll use it for the rest of pre season as they need to learn it while they already know how to play 433 (or variation). Missed the Roma game but can see the players are getting more confident on the ball. That one touch move in first half was a delight to watch, more of that but with goals on the end would be nice. This is a great read. Quite long though, been reading it off and on since this morning. Great insight into van Gaal's thinking. When at Bayern Munich, he once famously gave every player a piece of paper with the strength and weaknesses of their direct opponents on the pitch - even when the opponent was a fourth-division amateur side. Will we stick with 3-4-1-2? Or move to a different formation? Benaita should sort out the defence if the reported news is true. I think we will stick with the 3-4-1-2. Unless we go out and buy Di Maria or another world class winger. Apparently Barca are back in for Cuadrado. Should Rafael or Valencia play at right wing back or try to buy someone? I think today showed he'd change it if he thinks it's necessary, it didn't work in the end but at least he did something to affect the game from the touchline. Players, particularly the defenders, still learning the 3-4-1-2. I still think he'd like to play 4-3-3 but doesn't feel he has the wingers to do so. I don't think we were helped by injuries today, missing our best CB and best wing backs. Cannot, I repeat cannot play 3-5-2. It obviously doesn't work in English football.